When the people who were at the house consoling Mary saw her leave so hastily, they assumed she was going to Lazarus's grave to weep. So they followed her there. When Mary arrived and saw Jesus, she fell at his feet and said, "Lord, if only you had been here, my brother would not have died." "Where could I go but to the Lord?" These words to an old hymn speak the truth of Mary's heart. Through her confusion and loss, she comes and falls at the feet of Jesus. 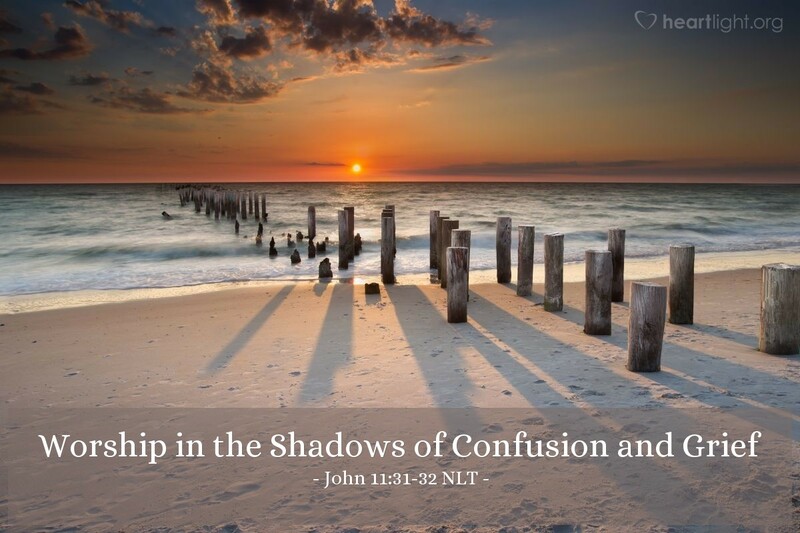 So often the evil one convinces us that our doubts, fears, confusion, and grief make us unacceptable to the Lord. But where else can we or should we go with these soul-wrenching concerns. If there is anything that the ministry of Jesus should teach us it should be this: We can come honestly to Jesus for truth, mercy, grace, help, forgiveness, cleansing, power, and love. Even if you don't know the "What?" or the "Why?" about the things going on your life, please know there is one waiting for you to share the burden of your heart. Dear heavenly Father, I have some folks who are truly on my heart and who need your presence and your blessing. I'm not sure if they can hold on to their faith much longer. Please minister in clear ways to them. I will continue to encourage them to come to you, but please, dear Lord, they need your help today. In Jesus' name, I pray. Amen.